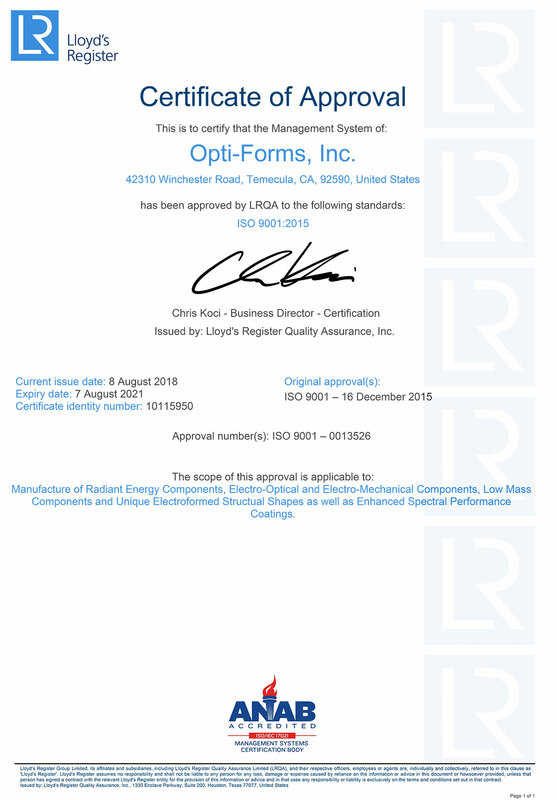 ISO 9001 Certified | Optiforms, Inc.
Optiforms, Inc. is pleased to announce that it has undergone a comprehensive audit by Lloyds Registrar Quality Assurance and successfully achieved ISO9001:2015 registration. 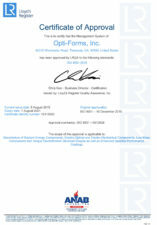 Optiforms, Inc. is proud to be ISO 9001:2015 certified. “Achieving registration to ISO 9001 is fundamental to our strategy of continued growth in the Aerospace, Defense, Medical, UV and the Semiconductor industries worldwide. This milestone solidifies the company’s core values in relentless pursuit of Quality and Customer Satisfaction.” says Kevin Thompson, Optiforms President. The company’s mission is to provide the best product possible for customers seeking the highest levels of performance. We continually advance our technology base providing precision electroformed optics and high-performance optical coatings. We have extended our leadership position by utilizing the latest technology in high-performance optical coatings and became the first in-house source for multi-layer coated electroformed optics.